Besides the alliterating when placed together, the words pizza and politics have nothing to do with one another and are rarely heard in the same sentence. One comes in a cardboard box, is slathered in cheese and has the ability to catch the attention of nearly any hungry college student. But the latter can seem confusing and off putting to many of those same students. 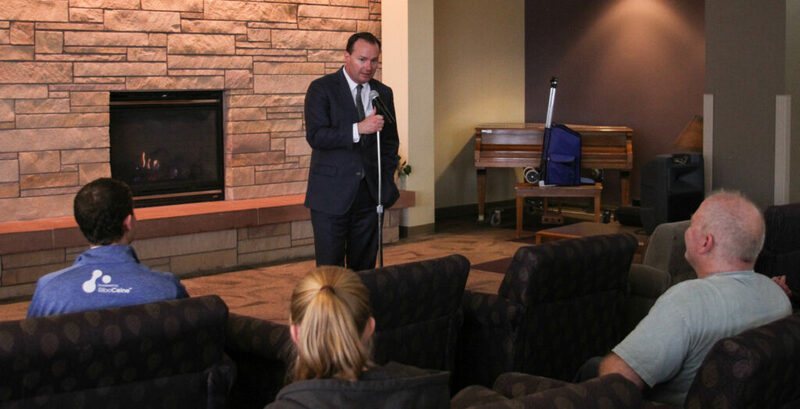 In the fireplace lounge on March 23, Weber State University hosted a political discussion with Senator Mike Lee, offering free pizza to any students who were willing to attend. But despite the lure of free pizza, the turnout was underwhelming, with no more than half of the seats filled. The empty seats seemed to stand as a visual statement, protesting the lack of political participation from college-aged citizens. “We’ve got to start paying attention to the fundamentals of the Constitution,” Lee said. Much of Lee’s speech focused on this preservation and protection of the constitution, particularly the separation of powers. “We concentrate more power in the executive branch,” he said. Reese Schumacher, a freshman majoring in political science, said he attended the event because of his interest in politics and his support of Lee. Schumacher also admitted that he wanted the chance to meet Senator Lee. “It’s not every day that you get to see a senator up close,” he said. Senior Sara Castillo, majoring in business administration, attended the event and was able to get a picture taken with Senator Lee. Schumacher believes that every American, including college students, should participate in politics. According to him, the right to vote and have an influence is one of the great things about being an American. It takes an effort to be involved in politics. Citizens cannot vote for just anyone, and for young adults who haven’t had much experience voting, it can be daunting. Lee offered advice for students who are facing these issue. Lee added that he felt with future generations, there are still brighter days ahead for the country. “I still believe that our best days as America are still ahead of us and not behind us,” he said.